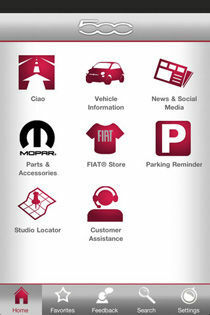 We've created this app especially for FIAT® enthusiasts. Whether it's learning about specific products, taking a tour through our brand heritage, or connecting with FIAT social media sites, we know you'll find this app useful. All 2012-2013 vehicle models are currently supported ‐ including FIAT 500, FIAT 500 Cabrio, and FIAT 500 Abarth(Spanish language support introduced for 2013). 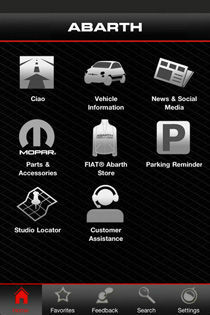 Additional app features include links to Mopar® parts and accessories, FIAT gear and merchandise, and FIAT news. It's like having a summarized version of your Owner's Manual. 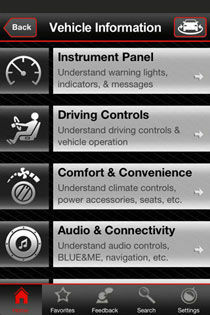 Key features include vehicle operating instructions, warning lights and indicators, inspection and maintenance schedules and explanations of all key controls including BLUE&ME™ and entertainment systems. This handy feature tracks your GPS coordinates and stores them when you park. So when you need to go back to your car and you're not quite sure where you left it, you can get directions. You can even set a reminder to go back and feed the meter.